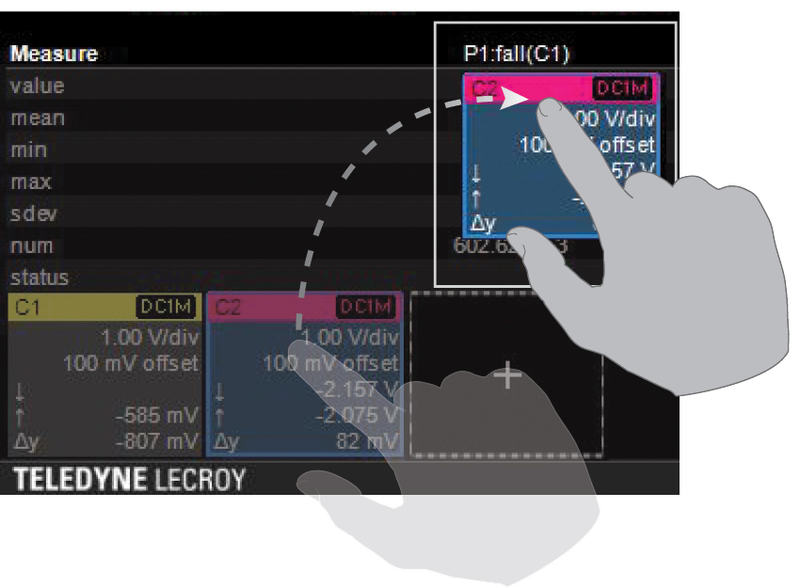 In more recent years, touchscreen technology has brought to bear a whole new level of interactivity in oscilloscopes. It took some of us a while to force our hands from the knobs and buttons of the front panel to explore the possibilities of touchscreens, but once we did, it was hard to go back. For example, the ability to simply draw a rectangle with your finger over a waveform trace to open a zoom trace is miles beyond what it took to zoom into a trace before touchscreens. Teledyne LeCroy has long been the leader in touchscreen user interfaces; our MAUI - Most Advanced User Interface is widely regarded as the industry's most intuitive touch-based interface (Figure 1). We have steadily improved MAUI over the years, while retaining full oscilloscope control from the front panel or a remote interface. However, more and more users have weaned themselves from the front panel and now prefer using the touchscreen exclusively to control their instruments. Thus, beginning with the recent launch of our WaveRunner 8000 oscilloscopes, OneTouch gesture control augments MAUI with new capabilities that make the touchscreen even more powerful, flexible, and intuitive. In a series of blog posts beginning with this introductory post, we'll explore OneTouch gesture control as a revolutionary step forward in touchscreen user interfaces (Figure 2). Let's start the exploration today with one feature of OneTouch: Copy Setup. If you're not familiar with MAUI, take a look at this blog post for a quick tour of the touchscreen interface. Those who are familiar with MAUI will recall the descriptor boxes that are found at the lower left of the display. These automatically appear with the opening of a channel, zoom trace, math trace, or memory trace, and serve to provide a summary of the current settings for each of those entities. Often, a signal fed to an oscilloscope will be way out of its default ranges for volts/division or vertical offset on all channels. If we wanted to input such a signal to more than one channel, we would need to adjust the V/div and offset settings on all channels, manually and independently. Copy Setup allows the user to "grab" a channel descriptor box with a prolonged touch and drag it into other channels. So if you've done the V/div and offset adjustments on, say, Channel 1, you'd simply grab the Channel 1 descriptor and drag it over the descriptor boxes of any other channels you'd want to set up the same way. You've just saved the trouble of setting up the other channels manually, and also eliminated the possibility of error in doing so. Similarly, if there is a particular rescale setting or signal pre-processing you want to quickly apply to all channels, Copy Setup does that job nicely. For example, perhaps you want averaging on all channels with interpolation as well as applying a common de-skew setting. Instead of setting up all those variables on four channels, you can now set them up on one and Copy Setup to the others. By the way, MAUI retains the means for copying channel setups from the Channel Setup dialogue box. However, that entails a five- or six-touch exercise rather than the one touch for Copy Setup. Where Copy Setup really shines, though, is with math functions and parameters. Setup for some math functions can get pretty hairy, with filters and FFTs being exemplary. If you wanted a particular filter configuration applied to multiple channels, you'd need to configure all of the various settings on all channels, including things such as filter type, cutoff frequencies, transition widths, and so on. It would be very easy to make a mistake without noticing. Not only that, but it's much more time consuming to set up all those variable fields. With Copy Setup, it's as easy as dragging one math descriptor box to another and changing the source. With parameters, Copy Setup has even more value. There are parameter gates that can be applied to all parameters. A common scenario is one in which you're measuring the same parameter on four channels or math functions, and you have four others with a different gate for a different parameter. Doing a Copy Setup of a parameter to another parameter means you only set up the gate once and then apply it to the others. Parameters also can have a lot of detail. Time-interval error (TIE) level, a key parameter in jitter measurements, is a good example, with two different tabs of details to configure in the setup dialogue box. Configuring those details, along with the parameter gate, is often time-consuming. When multiple channels are involved, it takes a lot longer while again adding ample opportunity for errors. Copy Setup is just the tip of the iceberg when it comes to MAUI OneTouch gesture control. Stay tuned for more posts with details on other OneTouch features.